Used by professional panfish guides! Amazing level of detail and craftsmanship is apparent in the antennae, tail, gills, claw, feathering on legs, and segmentation to overall appearance and proportion. A clinger type nymph, this bait has universal appeal. Creek, river, pond or lake, it doesn’t matter….fish will find this bait. Long lasting…this bait has lasted over 200 catches! Biodegradable. Phthalate and toxin free. 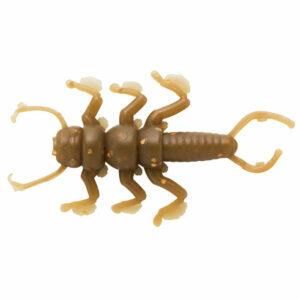 Store in the provided plastic case and away from other plastic baits.